Gossip, backbiting, slander and back-stabbing are things people commonly engage in without realizing the negative impact it has on individuals, communities, work environments and other social structures. People are hurt, communities disintegrate, work environments become hostile and unproductive, often due to a small thing called gossip. Gossip is like a weed that grows and if not removed quickly, it can destroy a beautiful garden. 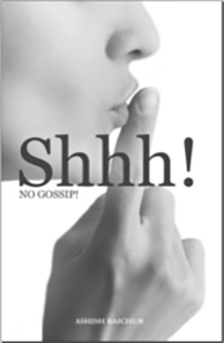 This simple book alerts us to Scriptural teaching on gossip, help us get rid of this lifestyle and also presents easy practical steps to handle gossip. We hope this resource will in some way help organizations develop healthy workplace environments; educational institutions to foster friendly and supportive student relationships; and people in communities to engage with a sense of love and concern for each other. Let gossip cease!